William Ernest (Ernie) Tucker (1931 - 2009) of Part Lot 24 Concession 12 Lakeside, signed up in 1951 and served for five years. 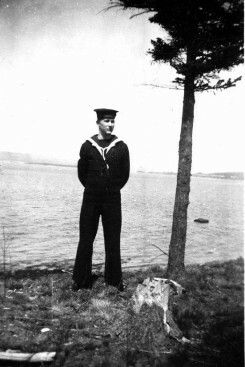 Training was in Nova Scotia and he served on HMCS Magnificent in the air division where he helped maintain the planes. They didn't see action in Korea but were at sea in the Caribbean and the Mediterranean. For a while, he and his wife Marion Helen (nee March), lived in Nova Scotia and then Prince Edward Island before settling in St. Marys at the end of his term.